We all know that hacks, deletes and errors happen every day. No one is secure. But the moment you’ve signed up to pCloud, you’ve got an instant peace of mind that your files are safe and secure. And now we will boost your feeling even more. We’ve got some new features related to backup. Social Media Backups! Now you can easily back up your photos and videos from Facebook, Instagram and Picasa. 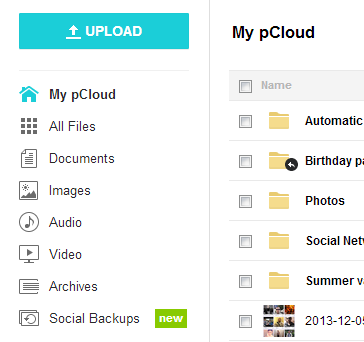 You can go to your pCloud account and see the new Social Backups section. Get into it and start backing up! Backing up all your Facebook, Instagram and Picasa photos and videos to pCloud is the smartest thing you can DO. Nobody wants to lose the precious holiday memories or pictures and videos of good times with friends. If anything bad happens to your social stuff, you will always have a backup copy stored in your pCloud account. With pCloud your online data is backed up on a regular basis. And don’t forget that once your files are backed up, you can easily share them with anyone or access them on any device, anywhere in the world. Oh, we almost forgot. Each back up earns you 500MB free space.